Those who fear that the substantial summer season melt of the Arctic ice cap, from 1/3 open water to now 2/3 open water, may lessen the flow of the Gulf Stream do not know oceans. The operative term here is “seasonal.” Sea ice that melts in summer, freezes in winter. The formation of ice increases the concentration of salts left behind in the seawater. This cold salty water is the densest in the world. It sinks to propel the thermohaline circulation of the world’s ocean currents. The energy moving more water volume is some of the energy trapped as heat by greenhouse gases from escaping into outer space. Global Warming directs instead more energy into extreme weather events, more extended droughts, more violent downpours, category 5 hurricanes with four times the fury of category 4 hurricanes, and more melting/freezing of sea ice. A greater Gulf Stream was apparent in October 2011 when it meandered up onto the continental shelf closer to Rhode Island than ever before. Rivers meander to dissipate energy gained from cascading down a great height or, for the Gulf Stream, being squeezed and jetted between the Bahamas and mainland through the Florida Straits. Viewed from high above there is resemblance to a train crash with forward momentum energy dissipated by train cars zigzagging every which way. End of the road for the Gulf Stream used to be Svalbard, an archipelago to the north of Norway where the Greenland Sea meets the Arctic Ocean. Until 2007 when warm Atlantic water surfaced and commenced the melting of glaciers in Svalbard’s fjords . This warm intermediate water continues north into the Arctic Ocean to circle counter-clockwise off Siberian Shores and on around to Greenland. This water gives off heat to the surface waters above, further contributing to the melt of the ice cap in summer. And thus, more ocean freeze pumping in winter. The increased flow of cold nutrient-rich Labrador Current water from Greenland to New England is good for marine life. The other water masses, Slope Water, Shelf Water and surface waters do not compare in the amount of life giving properties at the bottom of the food chain. Climate Change is nonetheless bad for the ocean because a third of the carbon in the atmosphere goes into solution to become carbonic acid. Because our carbon footprints are so large, the ocean is becoming more acidic. Already oyster farms have had to close because young oyster shells have dissolved. 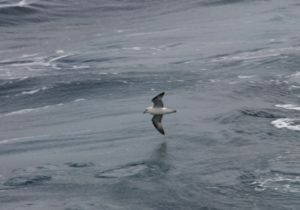 The Ocean River Institute is launching a citizen-science monitoring, educating and advocating offshore ocean waters program called Seamount Guardians and Deep Sea Canyon Rangers. We begin with Oceanographer’s Canyon located 140 miles southeast of Nantucket where sperm whales live year round. We are looking for a few intrepid individuals to assist with satellite imagery to view surfacing whales and the presence of ships to stop ship strikes from killing whales in the NE Canyons and Seamounts National Marine Monument. Be energized for healthy oceans as a savvy Deep Sea Canyon Ranger. 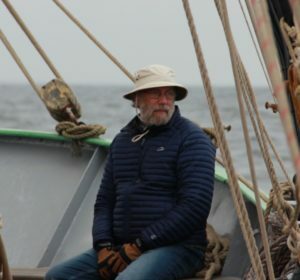 Owen Nichols, Director, Marine Fisheries Research at the Provincetown Center for Coastal Studies talked with Rob on Moir’s Environmental Dialogues about working a fishing weir on the south side of Cape Cod. Given a simplicity of design, that dates back at least two hundred years, with hickory poles set upright stringing large mesh nets, working the weir is surprisingly complicated with many lines to release and tie in just the right sequence. The beauty is that at any time a portion of the net may be lowered to release non-targeted fish. The result is a clean catch with nearly no bycatch. By attaching recording devices to measure dissolved oxygen, temperature, and water clarity much is being learned about the shifting conditions for commercially valuable fish. Owen was surprised to see in late spring and summer the extent that blooming algae followed by decomposing algae consumed much of the oxygen in the water. This made it uninhabitable for fish. I was surprised to learn that squid suffer when the waters become too turbid and they can no longer see each other. Learning the signs of falling dissolved oxygen levels, the onset of ocean dead zones, fishermen can better manage their fishing effort to be sustainable. New England’s most valuable fishery, scallops, have benefited from cameras attached to the scallop dredges. What is actually happening is revealed when cameras are deployed. Flounder, that settle into the sands to be inconspicuous, may be alerted to the on-coming dredge by a tickler chain that touches them to flee before they are captured. This opportunity to test a way to reduce bycatch came about only because fishermen worked in close collaboration with scientists. Longfin squid are a favorite animal of Owen’s and the focus of his Ph.D. research at U Mass Dartmouth. Squid egg masses are called mops because they resemble the tussled heads of floor mops. Owen has caged egg masses found attached to the fish weir so he can observe hatching and early growth stages. It is not known, when squid mops are stripped off of their holdfasts by fishing gear, if they still hatch. With shifting shoaling sands making up much of the ocean floors of Nantucket Sound, it is not known how much squid masses need to be attached or whether they can survive the strong currents tumbling along with it. The ocean is incredibly dynamic, influenced by many factors in unexpected ways. As a result, fishing practices must be ecosystem-based and very adaptive to changing conditions for each population of fish or squid. Today’s close collaborative work of fishermen with scientists is why America has the most sustainable fishery in the world. Yet, we’ve still got much to learn and work to do. And, if you see an egg mop on an ocean floor look for tiny infant squid. There has been much discussion on how Climate Change impacts the ocean. Researchers in Baffin Bay found proof of how the ocean takes up excess heat from the atmosphere by working with the resident whales, narwhals. 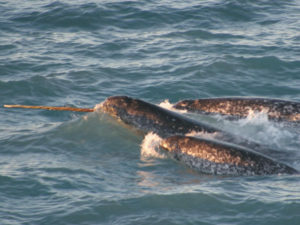 Narwhals, speckled blackish-brown over a white background, becoming whiter with age, are 13 to 18 feet in length from head to flukes. There is no dorsal fin. The neck of the narwhal differs from most other whales. Like land mammals, the neck vertebrae are jointed, not fused. The shape of tail flukes differs between females and males. Female whales have flukes similar to dolphins, the leading edge sweeps back to join the trailing edge obliquely, more of a triangle shape. The male narwhal tail has more of a moustache shape. From the “small” where tail meets body, the leading edge is more concaved dipping back and out. Jointed vertebrae and fluke hydrodynamics have evolved for male narwhals to carry a five to ten-foot long tusk that erupts through the lip on the left side of the upper jaw. What was once a canine tooth has become a most remarkable left-handed helix spiral. Millions of nerve endings in the tusk connect seawater stimuli with the narwhal’s brain. By rubbing tusks together male narwhals are thought to communicate water characteristics each has experienced. Narwhals may converse about water much like people talk of fine wines. Fourteen narwhals in Baffin Bay wearing sensor tags will tell us, later in this article, something about how climate change effects the seawater that flows into the Gulf of Maine. Conversations in Boston and Portsmouth on climate change impacts on the ocean have escalated to swagger. The Gulf of Maine is warming faster than any other water body in the world. Our waters are in the worst condition, and worsening faster than others, they say. The belief that one’s local ocean water body is warming faster than the rest of the ocean came suddenly, turned-on like a light switch groped in the dark, by a single science journal publication splashed by the media. 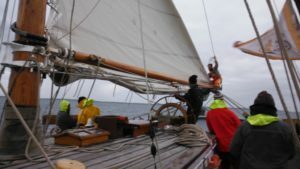 I was stunned to hear individuals who have spent much time on the ocean say something that was contrary to their own observations and personal experiences. Concerns of being the frogs worse off in a stovetop kettle arose from a report in a science journal. The findings boiled down to two sentences that gave alarm to the discussions that followed. “Between 2004 and 2013, the mean surface temperature of the Gulf of Maine rose a remarkable 4°F.” Last year’s “rise in temperature exceeded those found in 99 percent of the world’s other large bodies of saltwater.” The authors were quick to conclude that rapid warming of surface seawater due to global warming led to the collapse of the Gulf of Maine cod fishery. Perhaps there was too much deconstruction of marine ecosystems, too much simplifying down to one easily measured factor, temperature, that would tell all one needs to know. The challenge was to reconcile what the authors claimed with basic understandings gained through experience of the workings of oceans. A whale watch narrator out on Stellwagen Bank explained global warming as like a blanket on the water, warming it. Inferred was that this bit of ocean is warming faster than in other ocean places because there is a thicker blanket of greenhouse gasses here than elsewhere. I got an image of the world wrapped in a patchwork quilt of varying thicknesses, and unfortunately we got a thick patch. Not so, the greenhouse gasses of climate change are not substantially thicker on some water bodies than others. The winds blow around the world; they vary and change when land surfaces rise and fall, and warm and cool. The air molecules are redistributed evenly in the atmosphere. Some of the air we breathe was once air in China. Climate change carbon measurements are taken far from smog and smokestacks. First observations were made on Mauna Loa, Hawaii. Barrow, Alaska followed. Today American measurements of carbon in the atmosphere are also recorded in American Samoa and at McMurdo Station, Antarctica. There is some regional variation. The U.S. East Coast was recently reported with 412 parts per million carbon, slightly less than the North Pole (421 ppm CO2), and a bit more than the south coast of England (394 ppm CO2). At the science café in the basement of the Portsmouth Brewery, a marine biology graduate student studying lobsters said the surface waters of the Gulf of Maine were warming faster than anywhere else. It is a good thing lobsters don’t live in the surface waters, I said. No, was the reply, they can correlate surface water temperature with temperatures all the way down to the ocean floor. He went on to talk of how lobsters in the Gulf of Maine were being landed in record numbers while lobster populations south of Cape Cod were crashing to record lows. To the south, rising temperatures have been wreaking havoc to lobsters. How could the Ph.D. student, who knows the life of lobsters in cool and warmer waters, believe the Gulf of Maine water body is warming faster than anywhere else when these lobsters show no signs of heat stress? Lobster boats out of Martha’s Vineyard must carry a vat of boiling water in the back of the boat. The pots are dunked into the bath to rid traps of 30 to 40 pounds of algae before being set again. Lobstermen hold the nutrients coming off of lush green lawns of waterfront estates responsible for making life difficult. Three factors control algal blooms, daylight length, temperature and nutrients. The worst algal blooms are during the summer when daylight is longest, water warmest, and nutrient runoff or upwelling the greatest. Warm water holds less oxygen than cold. Algae can grow and die so rapidly that all of the oxygen is used up. This place becomes an ocean dead zone. Striped bass has been observed chasing bait fish. Suddenly all the fish roll over dead having swum into an ocean dead zone. The whale watch narrator and graduate student stretched their explanations to reconcile the incongruities of the claim trumpeted by the media. We defer and accept without question the conclusion of a reputable science article out of respect and because we want to be part of the “scientific community.” Most especially when it confirms something difficult to experience first-hand but no less real, Climate Change. Good science is repeatable. So I went into the kitchen to test my understanding of oceans empirically with a measured pint glass and a hair dryer. I poured some old wine up to the 12-ounce line. I added a level tablespoon of salt to bring the salinity to about 40 parts per thousand or 4% salt. This is a salinity that is closer to the Mediterranean Sea than to the Gulf of Maine. Like the Mediterranean, the Gulf of Maine is a sea beside the Atlantic Ocean. Due to the many rivers that flow into it, the Gulf of Maine is an estuary. It is less salty, about 34 parts per thousand. The Atlantic Ocean has a salinity of about 36 parts per thousand salt. The Mediterranean Sea is closer to 40 parts per thousand salt. The Sea is brinier due less outflow from the land, less rain water puddling on its surface, and more evaporation beneath clear blue Mediterranean skies. I stirred the pint glass with a long handled spoon. Later, when cleaning up, I found much salt still crystalized on the bottom, so perhaps this was closer to Gulf of Maine seawater after all. Tap water was poured from a small pitcher onto a spoon so as not to disturb the wine dark sea. I filled it to the brim, to the full 16 ounces. There was some mixing because the surface water floating on top of the sea took on a pinkish color. Where the water turned abruptly from pink to red was the halocline, the boundary between salty and fresh water. Global Warming came in the form of a turned-on hair dryer, held close to the surface of pint glass. The hot wind made the surface ripple a standing wave increasing the surface area and likely heat transfer. While the hairdryer blew hot, I watched the halocline at the 12-ounce mark in the glass, where pink water met wine dark. Turned the dryer off. There was no disturbance, no mixing of the surface layer with the deep. Energy as heat from the hair dryer had gone into the pink surface layer. The boundary layer between water bodies remained at the 12-ounce mark. Had the surface water mixed, the portion closest to the wine red water would have become the same color. The halocline would have moved up. The wine dark sea stayed separate because it was much saltier, denser than the lighter water on top. Water conducts heat rapidly away from the area in contact with the heat source. At sea level, water is 784 times denser than air. Water is so dense it bends light. As a result, seasonal hot air will not rise the temperature of a large water mass. A hair dryer works well for drying hair because warmer air molecules are moved over the hair evaporating water. The dryer moves moist air away to reduce the relative humidity, increases the dryness. This allows more water molecules to evaporate and leave hair. Convection is a more immediate transfer of heat. In the kitchen, water in a pan on the stove warms with convection. In the ocean, water warms by convection in deep hydrothermal vents with heat from deep within the Earth. Another form of heat transfer is radiation. This is how energy reaches Earth from the sun. Radiation is absorbed as shortwave radiation, more so on dark surfaces. It is then reradiated as long-wave radiation (heat). Heat does not pass easily through the atmosphere, so is trapped and hence a global warming problem develops. The warm seawaters south of Cape Cod and around Prince Edward Island are the result of two forms of heat transfer. The sun warms tidal flats at low tide, radiation. The water returns and is warmed by the bottom by conduction of heat, molecule to molecule. 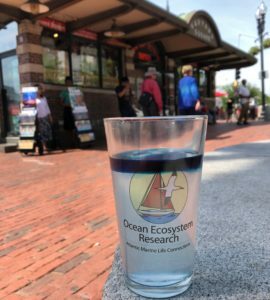 To better understand the interactions of different water masses in one water body like the Gulf of Maine, I set out two pint glasses about three quarters full of fresh water. In one glass I mixed in salt. 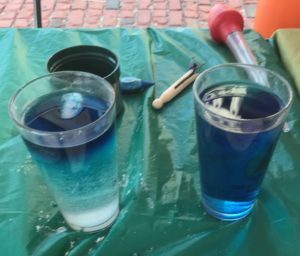 In both glasses I placed the same sized ice cube and splashed a drop of blue food coloring on the ice. The ice in the salt water floated higher, more out of the water because sea water is denser than fresh water. As a result, food coloring and melting ice water pooled on the surface of the glass. The surface water was a distinct blue line across the top of the glass. Meanwhile, in the fresh water glass, a plume of dark blue was cascading to the bottom of the glass and then feathered up into clear water. Though the ice cube was just as fresh water as the rest of the water, the ice water being much colder sank. It being very hot this bright August day, in a matter of minutes, the ice cube melted and the waters mixed completely. The experiment was repeated with new fresh water and by adding more ice cubes to the salt water glass. This deepened the surface blue water on top of salt. The ice cube on the saltwater lasted much longer than did the cube in fresh water. Touching the fresh water glass, it felt cool. Touching the salt water mass, it felt warm like the air. The fresh blue water on top was icy cold with condensation forming on the outside. Despite water conducting heat, there seemed to be no transfer across the flat boundary between fresh and salt water. The temperature of the surface water mass gave no indication of the temperature of the intermediate water mass below. 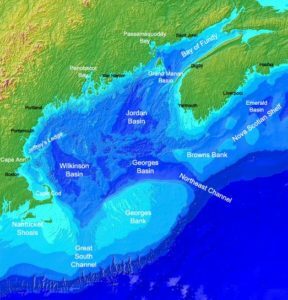 In the science journal, the much talked about warming waters was reported: “Between 2004 and 2013, the mean surface temperature of the Gulf of Maine rose a remarkable 4°(F).” Over a ten-year period of sampling the data, recent years were found to be four degrees warmer than much of the earlier data. Four degrees is most impressive for an annual summation of monthly averages; less impressive when comprised of just the hottest months of summer. Some June and July temperatures were four degrees warmer than normal and some three degrees cooler than normal. It is not obvious. Only by finding a statistical significance in the scatter of summer data points was it possible to make the claim. This begs the question of the corresponding winter surface water temperatures. Instead of a trend, the finding may indicate a greater oscillation of temperatures between summer and winter. The Northeast Regional Climate Center at Cornell University organizes weather and climate data both historical and recent. In 2013, the last year that the researchers observed surface water temperature, there happened to be extraordinary weather. From March to May, the Northeast overall was 1.3°F above average. Maine was the warmest, 1.6 °F above average. June was another warmer than-average-month in 2013 by 0.7°F. June was also very wet receiving 7.19 inches of precipitation. At 172% of normal, this was the third wettest June since 1895. Rains during the second half of May resulted in a wetter than average May, as well. The wet conditions of June spilled over into July for the Gulf of Maine. The region ended July with 5.14 inches of precipitation, 121% of normal, making it the 15th wettest July since 1895. With an average temperature of 72.4°F, July was 2.5°F above normal and the 12th warmest July on record. Raindrops, when condensing into formation, release heat to the atmosphere. A dramatic increase in the normal precipitation might create above average temperatures, all other actors being equal, which they likely are not. Clearly in 2013 there were excessive amounts of warmer water flowing off the land. Fresh water spreads out across the sea’s face swelling the surface waters. A greater volume of fresh water coupled with unusually warm weather slows the usual cooling of surface waters by the intermediate water below. In 2014, a satellite was put in orbit and the Northeast Regional Climate Center began reporting on surface water temperatures throughout the Gulf of Maine. These reports reveal a remarkable complexity of surface temperatures influenced by proximity to shore, depth, currents, wind and weather. Weaker warm water anomalies of less than 2°F over the deeper waters of Jordan Basin and the shallow waters of Georges Bank were observed. For Massachusetts Bay and directly east of Cape Cod, within the Gulf of Maine, cold surface water anomalies were observed of around -0.9°F. These colder surface waters found that summer were primarily a result of cooler weather conditions in July and August. Warmer waters were observed closer to land with rivers. With twenty-five major watersheds, there was much water from the land. The four largest rivers (St. John, Penobscot, Kennebec and Merrimack) discharge about 60 billion cubic meters of fresh water per year, mostly during spring and summer. A small change in the outflow of rivers can produce a large change in the inshore summer surface waters of the Gulf of Maine. Slippery sea is a lens of fresh water on top of salt water that is sufficiently shallow to be pushed by the wind to slide over the sea. This results in a stronger current or a surface current that differs in direction from the main current. 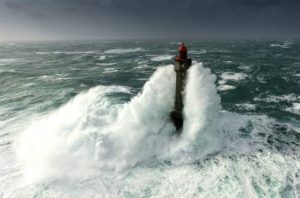 For sailors, it is to know where the sea slides that wins the race. What people do on the land affects the ocean. Cutting a forest removes a natural sponge and expedites the flow of more water to the sea. Removing concrete to plant a garden restores retention and reduces runoff. Long showers, or washing a car with a hose instead of using a bucket impacts in small incremental ways the surface waters of the Gulf of Maine. Those who practice the dipstick science of taking a temperature only at the sea surface to assess ocean health, like a Fitbit on one’s wrist, are not going deep enough and are using the wrong instrument. It’s not temperature but water density that interests us, and the instrument to measure that is a hydrometer. When a science teacher, my students made hydrometers by sticking a metal tack into the eraser at the end of a yellow pencil. With tack for ballast, pencil floated upright in a glass of water. Where the water met the air, the water line was marked on the pencil. Four glasses of clear water representing river, estuary, gulf and ocean were measured. By noting the water lines drawn, students could arrange glasses of salt water from least to saltiest, without having to taste the water. Down on the waterfront similar water lines markings can be found on the sides of ships. These marks are named for Samuel Plimsoll who in 1876 put a bill through the British Parliament that mandated reference marks be drawn to indicate the maximum depth that the vessel may be loaded with cargo. The water line must not be above the Plimsoll line or the ship is at risk of sinking. Plimsoll Lines in yellow, near the middle of the ship by the water. Ships takes on cargo and loads until the waterline meets the proper Plimsoll line. In St Johns Newfoundland during the winter, cargo is loaded until the waterline reaches the lowest mark, WNA. 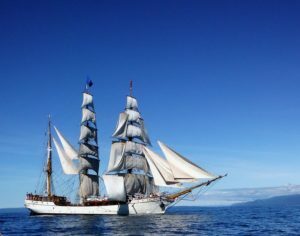 The ship steams to a location one hundred miles offshore of Brazil, where the ocean is colored brown by the plume of fresh Amazon River water. 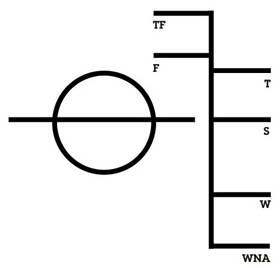 Here the waterline is at the highest Plimsoll line, TF for tropical fresh. The weight of the ship has not changed. The amount of freeboard changed as the density of seawater changed. Displacement of the ship went from riding high on the densest water in Newfoundland during the winter to the floating low in the water where it was least dense in tropical fresh water. A submarine diving down vertically through the water column will also pass through different water masses. The change in water density is sudden at the thermocline. It is so dramatic that sound-navigation-and-ranging (sonar) will not penetrate the boundary layer. Sound emanating from within the water mass, say the call of a whale, reflects against the smooth thermocline with very little loss of energy to absorption. The water mass becomes a long distance sound channel because sound waves never interact with the seafloor or ocean surface. Low-frequency sounds travel further than higher frequencies. Thus, a blue whale or fin whale singing at 20 hertz will have a greater range of communication than the minke whale with 80 hertz calls. The practice of finding the thermocline was perfected during World War II in the Straits of Gibraltar. Two currents flow between the Atlantic Ocean and the Mediterranean Sea. Mediterranean Outflow water is saltier and denser. It flows out under inflowing Atlantic water which is less dense even though it is colder. The problem was German submarines were passing Gibraltar undetected by turning off their engines, drifting in on Atlantic water and out deeper down on Mediterranean. Setting off depth charges in one water mass would not sink submarines in the other. There was a need for an instrument that would find the thermocline, identify the boundary between Atlantic Water above and Mediterranean Outflow below. Athelstan Spilhaus built the bathythermograph with much ingenuity. A copper thermo-coil unwound with increasing temperature and wound tighter when colder. A point was put on the end of the coil. To measure depth a small bellows contracted with increasing pressure. A glass slide was mounted on the bellows that contracted with depth. The slide was coated with a single layer of gold. The point on the thermo-coil scribed through the gold when coil moved with temperature and slide moved with depth. 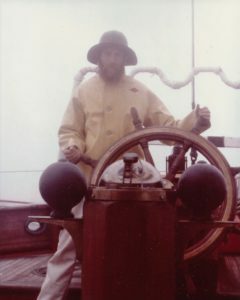 On the Research Vessel Westward, a 100-foot steel brigantine sailing ship out of Woods Hole, I was responsible for deploying the marvelous yellow torpedo-shaped device. The four-foot long device was shackled to a wire. A small electric winch was bolted on the deck of the ship near the back. The bathythermograph was dropped into the water. As it sank the winch spun freely, whining for a set amount of time until I applied the brake. A couple of hundred feet of wire was taken up by the winch and the bathythermograph was lifted aboard. A curved flush two-inch metal plate was slid back and the wet glass slide was pulled out. One had to be very careful, while often working on a heaving sea, to hold the slide by the edges and not to smudge the layer of gold on glass. The slide was placed in a black metal viewer that showed when held to the light, the squiggle line against a grid of temperature and depth. The water went into the lab and was titrated. A reagent was carefully measured drip by drip into a beaker of stirring seawater until it suddenly went from clear to a dark color. After some calculations, the amount of reagent added worked out to the amount of salts in seawater, the salinity. The life of an oceanographer was mostly getting splashed by menhaden oil, watching water drip, and mixing up starch solutions in the galley at odd hours of the day. Oceanographers were known by their silver-nitrate stained fingers. 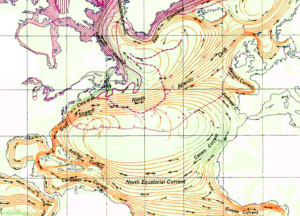 Out on the bounding main, ocean currents are driven by wind, tides, density gradients and planetary motion. The world turns to the East. Because of the planet’s turning motion winds that blow towards the North Pole will track to the right, a bit to the East. This bending to the right is called the Coriolis Effect. 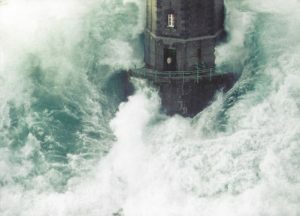 When the wind blows the top of the water starts to move with the wind and shears against the water below. Due to the spin of the planet the water feels the Coriolis force and will move a bit to the right of the wind. The water below that water will flow a bit more to the right. The result of increasing right turns with depth, each with less current than the one above, is called the Eckman Spiral. When a land mass is encountered in the Northern Hemisphere the waters will veer to the right (left in the Southern Hemisphere). This sets up the clockwise gyre of waters in the upper 100 meters with the Gulf Stream flowing north and the Azores Current flowing south. Another phenomenon set up by the Earth’s rotation are Kelvin waves. Stir a cup of coffee and the swirling liquid does not stay flat but wobbles or waves up and down. These are very fast moving waves of low amplitude. Kelvin waves are contrarian, at the equator they propagate to the east, against the trade winds. In the northern hemisphere, Kelvin waves go in a counterclockwise direction using the coastline as a wave guide. As a result, coasts on the east side of the ocean receive more energy, more wave action. Here, west-facing harbors will often see more dramatic tides than do harbors on the opposite shore. Most of the ocean moves to thermohaline circulation. That is, it flows to different water densities. The pump house for the world’s ocean is located near the bottom, the Antarctic, where water is coldest and densest. In the ice forming process, salt is extruded out to increase the density of the surrounding waters. Surface waters become dramatically denser in the flash of a freeze to sink into Antarctic Bottom Water. Freezing seawater at the surface drives the deep ocean waters below. The colder the winter the more sinking of dense bottom water. The greatest impacts of Climate Change are found at the North Pole. Once the summer Arctic Ocean stayed mostly icebound with 2.7 million square miles of ice. Since 1979, the summer ice extent has declined on average 13.4 percent per decade. The smallest Arctic ice extent was recorded in 2012 with 1.32 million square miles of frozen ocean. Where once about a third of the Arctic Ocean was open, now it is about two-thirds ice free. With twice the open water in the Arctic Ocean during summers, during winters there is a much greater volume of surface water freezing. This cold extra-salty water is the densest water in the world. It is also found in the formation of sea ice in the Southern Ocean that circles the Antarctic. This displaces, pushes the circulation of the world’s deep water masses. With more volume, the intermediate water mass moves counter-clockwise around the pole over the top of Greenland, south into Fram Strait towards Iceland, and on to the Atlantic Ocean. To the east of Iceland across “dull and dark water” of the Fram Strait is Svalbard, an archipelago at the end of the road for the Gulf Stream. At least until 2007 when warm Atlantic Water surfaced for the first time and came ashore. The fjord ice on Svalbard is now disappearing at great speed due to more heat from more Gulf Stream water. Atlantic Water that has warmed 2°C in the past 30 years streams poleward from Svalbard beneath the surface water into the Arctic Ocean. It veers right above Norway to course along Siberian shores. The Atlantic Water core temperature decreases as it moves cyclonically around the Arctic. Heat lost to surface waters above accelerates the melt of the polar ice cap. With less ice cap, expect more sinking salty dense water come winter. To recap, increasing greenhouse gases trap increases amounts of heat in the atmosphere. We call this global warming. Energy as heat that once went into outer space must go somewhere. Energy is spent on extreme weather events, more extended droughts, more violent downpours, category 3 hurricanes going to category 5 in 24 hours (Maria and Irma, where category 5 hurricanes have four times the fury (energy) of category 4 hurricanes), and more melting of sea ice. The Arctic Ocean during winters has twice the open seawater due to a shrinking ice cap, greater volumes of water freeze. With ice formation salts concentrate in the liquid, out of the ice. Water around the floating ice becomes saltier. Very cold and denser it sinks. This pumping action of deep water formation puts more energy into the thermohaline circulation to move more of the world’s ocean. More water, not less, was observed coursing the Gulf Stream in October 2011 when the Stream meandered in a deeper curve swinging further northwest. The Stream’s core for a month or three flowed closer to Rhode Island than ever before. The Gulf Stream is like a river that gains much energy cascading down a mountain. When the waters descent is stopped by hitting a plain, the energy must go somewhere rapidly. Energy must dissipate, and so the river meanders. With more volume and more energy, it curves back and forth instead of flowing a straight line. The greater the river’s departure from the straight and narrow, the greater is the river’s “sinuosity,” as it gives up potential energy. Viewed from a distance on high the course of the river can remind one of a freight-train crash dissipating energy by sending cars every which way. The Gulf Stream is forced to accelerate through the Florida Straits. More water volume through the Straits results in more energy to release. This water energy, called the potential-vorticity budget, is spent on the structural distortion of flow in a meander compared to the straight portion. Meanders bunch up and circle back to cut off, “ox-bow,” warm-core eddies that spin westerly and cold-core eddies that drift east into the Sargasso Sea. The unprecedented large meander up onto the Continental Shelf off Rhode Island indicates there’s more warm water in the Gulf Stream barreling north to the Arctic Ocean. This brings us back to the narwhals mentioned at the beginning of this essay, since here on the threshold between the Arctic Ocean and the Atlantic Ocean is where they live and carry out their own sophisticated monitoring processes. Baffin Bay, located to the west of Greenland, is actually an arm of the Atlantic Ocean. Here there are three water masses. Arctic Water is near the top. West Greenland Intermediate Water in the middle, and Deep Baffin Bay Water in the deepest basins. The surface water on top was found to have a thermocline at a depth of less than 300 feet. This indicates the extent of downward reach of air and land-runoff temperatures, as only the surface waters change with the weather. Baffin Bay is often not the calmest waters for ocean research and the nimble bathythermograph has been replaced by a multitude of horizontal Nansen-like bottles attached to a large metal frame called a rosette. The conductivity-temperature-depth instrument, the CTD, works on the principle that seawater conducts more electricity when it is denser. The CTD-Rosette is lowered from a worm-gear hydrowinch that carefully pays out the cable. Much cable is needed. The average depth of Baffin Bay is 3,000 feet. In the deep basin known as Baffin Hollow the depth is 7,008 feet. It takes many hours to sample the three-layered water column all the way down. 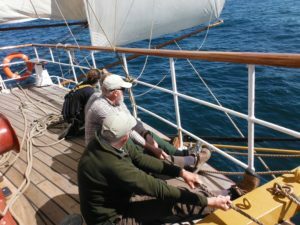 To find evidence of seawater warming in Baffin Bay, researchers found historical data sets collected between 1950 and 2003. Bottom water temperatures exhibited a statistically significant warming at depths between 1,300 to 7,000 feet. The maximum warming was found in a water mass at depths between 2,000 to 2,600 feet. This warming of Intermediate Water was as large as 0.2°C (0.36°F) per decade. Given the challenges of deploying CTD Rosette water trapping arrays over the side of a ship and the amount of sea ice in Baffin Bay that could wreak havoc to a ship tethered for the better part of a day by hydro-winch cable to gear over the side, researchers turned to the local narwhal population for assistance. Narwhals dive to the ocean floors of Baffin Bay for Greenland halibut ten to twenty-four times a day. Fourteen narwhals were captured and fitted out with satellite‐linked time‐depth‐temperature recorders. When they surfaced, data was transmitted to the researchers. CTD-Rosettes were used from ship and helicopter to verify the accuracy of what the whales were finding. One of the deepest diving cetaceans in the world, narwhals proved to be excellent “ocean samplers.” Dives lasted more than twenty-five minutes. Given the distance underwater involved, dives were vertical. Deep vertical dives are ideal for repetitive depth and temperature casts. Narwhals also favor diving for fish beneath Arctic offshore ice. For obvious reasons these are areas where few oceanographic studies have been done. Much of Baffin Bay is covered by ice in various forms throughout the summer. Tags put on narwhals in August and September lasted up to seven months before falling off. Data was transmitted with every surface and every breath of the whales. Data was collected well into the winter months. Narwhals documented that the surface water, in contact with overlying sea ice cover, was thinning. The thermocline had moved up and the surface water was 160 to 260 feet less deep than previously observed. Beneath this relatively cool water is a much larger warmer water mass, the West Greenland Intermediate Water. Narwhals found that the depth of cool surface water is lessening and warmer waters below are expanding upwards. Forced between Iceland and Greenland, the cold water current narrows into a “jet” of higher energy flow. The Arctic water mass crashes into the bulwark front of warmer Atlantic Water. Energy is deflected, Arctic water plunges downwards into the Denmark Strait Cataract. This is the world’s largest waterfall. One-hundred-seventy-five million cubic feet of water per second, about 2,000 Niagara Falls, plunges 11,500 feet down, three times the height of Angel Falls in Venezuela, to form the West Greenland Intermediate Water. The West Greenland Intermediate Water flows south between the King Frederick VI Coast of eastern Greenland and the Reykjanes Ridge, the portion of the Mid-Atlantic Ridge south of Iceland, the seam of the spreading Atlantic. At Cape Farewell, the southern tip of the world’s largest island, Greenland, with its ragged black slates and schists that tower 2,000 feet. The current hugs the shore to the right (west) to flow northwest off Greenland’s western shore. On the Cape Farewell Ground, two to four hundred miles south of Greenland, five stationary hydrophones were deployed to listen for whales. The North Atlantic right whale has a distinctive “up whoop” call like no other whale. Shifting through the cacophony of ocean sounds from July to December, 2007, researchers identified more than 2,000 calls of right whales. They think at least three whales, maybe more, were heard. During the last fifty years two right whales have been sighted on Cape Farewell Ground. One had only rarely been seen with the Gulf of Maine population, and the other had never been seen. This gives hope that the historic eastern North Atlantic right whale population may still exist. The West Greenland Intermediate Water makes a “U” turn in Baffin Bay. Flowing south out of Baffin Hollow, the water mass moves through the Davis Straits at a stately pace of about one mile per hour. Entering the Labrador Sea, the water mass mixes and increases in volume with the colder and less salty Baffin Island Current to become the Labrador Current. 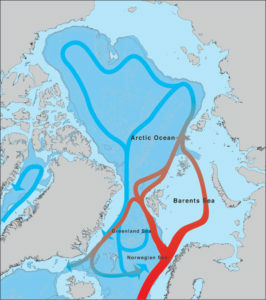 Nutrient-rich waters from the Arctic are enhanced with nutrient rich waters from Russian and Canadian rivers, including the Mackenzie River, second only to the Mississippi in North America. The combined current flows southeast moving seawater at 7.6 sverdrup or 7.6 million cubic meters per second. Transporting icebergs, the Labrador Current is a hazard for ships. Off the craggy, steep-sided coast of Newfoundland, the traveling water mass influenced by the Coriolis effect veers right with centrifugal motion to a southwesterly direction. On to the Flemish Cap, a 12,000 square mile international fishing bank. Before the Cap the Current splits, right to pass through the Flemish Pass Basin next to Newfoundland, and left, to flow outside the cap in deep water over the Sohm Abyssal Plain. The nutrient-rich waters of the Labrador Current pass below nutrient-poor warmer waters transported north by the Gulf Stream. Heavy fogs arise from the meeting of the two water masses. 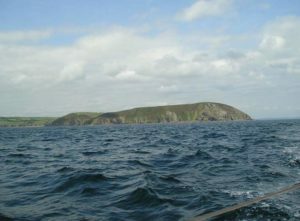 In the mix is one of the richest fishing grounds in the world. The Labrador Current traverses the Scotian Shelf. A portion enters the Gulf of Maine through the Northeast Channel, the sixty-mile-wide deep-water passage is between Browns Bank off Cape Sable and Georges Bank off Cape Cod. 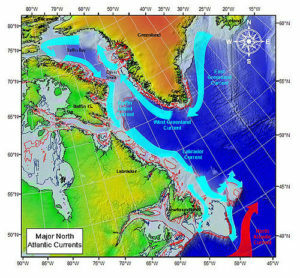 Much of the Labrador Current continues souths towards the Equator bringing nutrients to the southeast corner of Georges Bank. The volume of Labrador Current water entering the Gulf of Maine varies unexpectedly from year to year. As we say, barn door open, barn door closed, or barn door ajar. The less Labrador Current Water entering, the more Slope Water floods into the Gulf of Maine. Capelin and to a lesser extent sand lance are most abundant in Labrador Current water. Cod, halibut and other demersal or ground fish forage Labrador Current water for capelin and sand lance. An increase in volume of Labrador Current water in the Gulf of Maine likely positively impacts marine life on up the food chain, including populations of commercially valuable fish and squid. Clearing the Northeast Channel, the Labrador Current spills into Georges Basin. Then north to Jordan Basin and counter-clockwise to the west into Wilkinson Basin. The cold Labrador Current deposits the last of its nutrient-rich load from the Arctic beneath the Western Maine Coastal Current in Bigelow Bight off the sandy shores of Plum Island, Massachusetts and Rye Beach, New Hampshire. Within the Gulf of Maine are three distinct large bodies of saltwater. In the deep portions of the Gulf there is Labrador Current Water. Warmer Slope Water covers the Labrador Water. 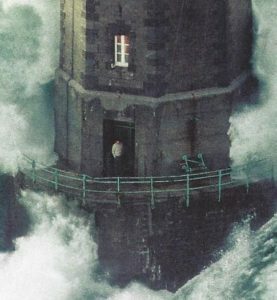 Should the “barn door” be closed only Slope Water enters the Gulf. Higher in the water column is Shelf Water. This water masse spreads out over the banks as well as deeper portions. Thus, the Gulf of Maine is like a layer cake with fresh surface waters frosting the top. Cold dense nutrient-and-oxygen-rich waters from the Labrador Current spreads deep below Shelf and Slope Waters. The waters of the Gulf of Maine are warmed from a distance. Warmed by the Gulf Stream jetting through the Florida Straits and meandering off the eastern edge of Georges Bank. The Gulf of Maine is also warmed by river flow that is heated by the land; and warmed the years when less of the capricious Labrador Current enters through the Northeast Channel. There is a more destructive impact of climate change on oceans than changes in temperature. Whenever four CO2 molecules are released into the air, one of the molecules goes into the ocean. A chemical reaction follows that results in a corresponding rise in ocean acidity. The seawater is becoming more corrosive, destructive of calcium-based life forms. As a result, oyster farms in Oregon were closed when their oyster spats fizzled and dissolved, lost to ocean acidification. Clams may be next. This worries me because I like clam chowder, fried clams, and to see them squirt when walking at low tide on clam flats. The ocean place near my home is not warming faster than other places. Its thermodynamics are not special; it is connected, part of the planetary whole, one ocean covering 71% of Earth. The wondrous blue Ferris wheel of surface and deep water masses revolves about every 1,000 years, give or take a few hundred. Our respect for the ocean is advanced when we better understand the movements, bounded by density, temperature and salinity, driven by ice formation, carrying nutrients towards the equator and heat to the poles. In Baffin Hollow, narwhals have parted water that has settled in the three basins of the Gulf of Maine. They surprised us with unexpected measurements of the ocean’s capacity to absorb heat from climate change. Intermediate water expanded skyward into surface waters. There were less increases of temperature and more energy, more flow of ocean currents to drive the planet’s superhighways carrying nutrients south and heat north. Narwhals, dowsing water with sensitive spiraled pointers and diving in pursuit of halibut, have told us much about our ocean and of sea waters thought familiar. The NE Canyons and Seamounts Marine National Monument is threatened by big oil companies that are seeking permission to drill in Lydonia Canyon. The solar cell industry wants to strip-mine seamounts for tellurium with robotic submarines, not a lot of jobs there. It would be more profitable to destroy a seamount than to continue buying from the Chinese (who bought and keep closed America’s only tellurium mine, in Mountain Pass, CA). In Belgium, tellurium is being recovered from discarded solar panels and computer boards. This national park area was created much like the Grand Canyon National Monument by President Theodore Roosevelt in 1908, to protect a spectacular place from exploitation and profit by big industries, in particular oil and gas drilling and mineral mining. It took Congress to the end of President Wilson’s term to legislate the Grand Canyon National Park. During World War 1 there was a great demand for mineral mining, and it was no surprise Congress waited until after the war to legislate the national park. Today, it is into these marine national monument waters that fourteen lobster boats continue to go. Out more than 200 miles from home ports in RI, MA and NH, they go to trap lobster along the fringe of the Monument, to work the ribbon of water less than 500 meters that wraps the northern extent of this place. Lobstermen are the watchmen of the deep sea canyons, eyes on the resource despite the size of waves that may roll and crash, guardians of the new national park area for no one else is out there on a regular basis. Spoiler Alert: I happen to be in Lark Harbor Newfoundland when a right whale was found dead over the mountain in Cedar Cove. I spoke with the locals and learned they knew of ten right whales in their neighborhood, likely not part of the whale count made closer to PEI. While 13 dead right whales dead, ten dead in the Gulf of Saint Lawrence, is a tragedy, these deaths may cause a paradigm expansion, if not shift, in our understanding of the North Atlantic right whale population and where else they go summer and winter. Here are compelling reasons why there are more North Atlantic right whale than the reported 525. It began with listening and observing locally. I invite you to add your right whale observations and thoughts in a comment below. The tenth right whale known to die in the Gulf of Saint Lawrence was found in Cedar Cove, Newfoundland. Nobody lives in Cedar Cove because it is on the outside of the Bay of Islands facing weather that rushes head-long across the Gulf of Saint Lawrence. Cedar Cove Trail Head Parking Lot is at the end of the road from Corner Brook. Past York Harbor and Lark Harbor, the road ramps up through spruce forests around table-top moors to a place known for the best beach combing in Newfoundland. 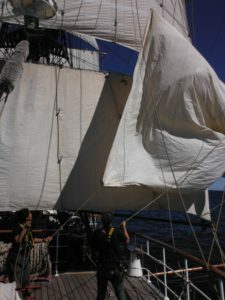 August 2, 2017, the day the whale was found, I was offshore of Cedar Cove on a tall sailing ship, the bark Europa. We had anchored the night before in the harbor named for the HMS Lark that was in this place 250 years ago. We cleared the Bay of Islands in the morning and headed south along the western shore before Cedar Cove. The wind was very light from the north. 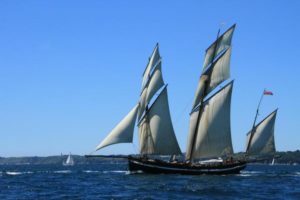 In addition to the five square sails on fore and main masts, plus gaft-rigged mainsail on the mizzen, stunsails were set with clews pulled out on whisker poles, three above each other on either side of the foremast sails. 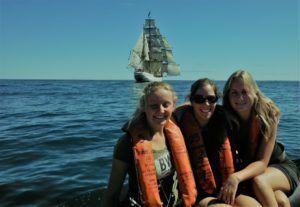 The next day I was told of the dead whale by a crew member from Corner Brook. This was not the first right whale to perish close by the Bay of Islands. 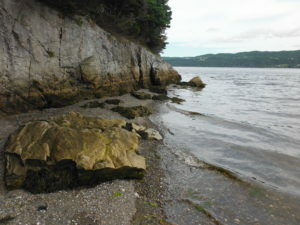 A right whale was also found dead in Chimney Cove on the outer shore just north of the Bay of Islands. The local knowledge was that eight right whales were feeding in the mouth of the Bay of Islands. This is arguably Newfoundland’s most important estuary due to the cold waters that flow down the Humber River from Deer Lake. This is a strong salmon run with grilse, small salmon, and salmon weighing more than 30 pounds. Here’s proof of a healthy ecosystem. This summer a right whale was also found dead in the very Southwest corner of Newfoundland at Cape Ray, fifteen miles west of Port Aux Basques. A fourth right whale was found dead on the Western shore south of the River of Ponds. This whale expired about 275 north of Cape Ray, twice the distance north to Bay of Islands. There were seven Corner Brook residents on board the ship. With long night watches, we talked. For them the tragedy of right whale deaths was eclipsed by the joy and pride that North Atlantic right whales were summering in their neighborhood. The challenge is that right whales are very difficult to see. They swim slowly with mouth open filtering out plankton through baleen plates that hang down in the mouth. At times, with top lip above the water and baleen visible, a clickety-clack sound may be heard of plates hitting one another. They lack the speed, wheel and splash of fin and humpback whales. They do not have a dorsal fin. Flat-backed, slow moving, a right whale on the water looks much a like floating log. What is distinctive off the sands of Provincetown is not so obvious in Bay of Islands because Corner Brook has at the water’s edge mountains of logs piled next to the paper mill. Eight right whales were individually known. Two of the dead whales had unique callosity markings, clearly not of the seen whales. The other two whales found dead were too far gone to be individually identified. At least ten whales were on the west coast of Newfoundland, likely more. North of the Magdalen Islands a badly decomposed right whale was found bobbing on the surface. West on the other side of the Gulf of the Saint Lawrence close by Quebec’s Gaspe Peninsula, five right whales were found dead. One right whale was found on the northern most cape of Prince Edwards Island near Norway. These places are about as far from Newfoundland as Boston is from Yarmouth Nova Scotia. The Gulf of Maine is about 70,000 square miles and Gulf of Saint Lawrence is roughly 91,000. These are spacious seas where North Atlantic right whales dwell. The trouble for right whales in the Gulf of Saint Lawrence is that it drains the Great Lakes. This means more boat traffic, strikes, and more pollution, lessening fertility from toxic chemicals that bio-accumulate in fat cells passed from mother whales to young, as well as more harmful algal blooms. 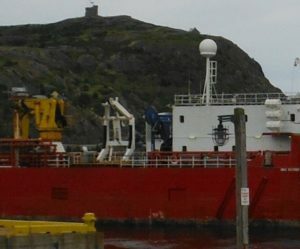 The Canadian government is responding by slowing ships and reducing fixed fishing gear to tangle with. Only we can reduce harmful chemicals and harmful algal blooms. In 2013 the reported North Atlantic right whale population peaked at 476, having climbed from 291 in the late 1990’s. The population appeared to drop a bit in 2014. So, in 2015 the first survey of the Gulf of Saint Lawrence was held in western portions near Prince Edward Island. Forty to forty-five right whales were sighted. The same number was found in 2016. This summer 100 North Atlantic right whales were documented in western reaches of the Gulf. Indubitably, for North Atlantic right whales the Gulf of Saint Lawrence is an important habitat area not yet well described. In this magnificent place, there is hope (and not “catastrophic lost”) for right whales. New summer residencies for right whales are all the more meaningful when the winter location of much of the right whale population is unknown. The good news are reports the population of North Atlantic right whales is 525 whales. There are compelling indications of even more right whales. The wintering grounds for much of the population is not known. Genetic studies of the right whales calving off of Southeastern US found that when sampled again in summering areas only 60% of all known calves were with their mothers. The remaining 40% of calves were not observed on known summering grounds. Right whale paternity analysis found fathers of only 45% of known calves have been genetically determined. Since genetic profiles have been determined for 69% of all photo-identified males, the population of male right whales is likely larger than reported. For the people of the high granite outcropped shores of Newfoundland as well as those of the lobster-red sandstone ledges of Prince Edward Island, the question is not why would right whales leave the Gulf of Maine. They wonder what took the right whales so long to rediscover spectacular seascapes. I believe the answer is due in part to fishermen sinking and reducing fixed gear lines, and to ship operators slowing to ten knots when whales are nearby. For the right whales once on the brink of extinction, the Gulf of Saint Lawrence provides vast watery realms where whales stoke up on shoals of plankton. For us, here are more opportunities to view right whales without disturbing them. This is a wonderful benefit for everyone. With right whales, knowing of their outsized majestic presence, life is better for us all. Feeling better for right whales, I am more concerned with sperm whales of the NE Canyons and Seamounts National Marine Monument, as I explain in this short video. High cirrus clouds stretched white gauze across the sun leaving patches of blue sky. I freed my bike from the stand by my office in Harvard Square at about 1:30 pm. Only the leaves at the top of trees moved slightly to a wisp of a Southeast breeze. Riding home along Kirkland Street the breeze was only apparent wind striking me face-on. The harder I peddled the faster the wind. The air was thick with mid-day heat. Moving down the road had a feeling of swimming to it. Home in Somerville, I walked my bike to the backyard. Opening the wooden gate, I heard the “cluck” of a disgruntled black bird moving away from me from dogwood perch to redbud tree branch, and then off across a neighbor’s yard. Sparrows flitted about in leafy trees and over to evergreens. I went through the backdoor to the kitchen. On the counter was a pair of solar eclipse viewing glasses that my wife had had the forethought to order weeks ago. I stepped out onto the back porch, put the glasses on, and looked up at the sun. With such opaque glasses the blackness was absolute, punctured by a round sphere the size of the sun. The strange lit circle was broken by a smudge of blackness on the lower right side of the arc, at about 5 o’clock on a clock face. The solar eclipse had begun before 1:37 pm. Contrary to the illustrations in today’s Boston Globe, the moon was on the move across the sun from right to left, from west to east, at least according to my earthly perspective in Somerville. This because the view from my back porch is of the moon moving slower than the sun. It cycles around closer to every 25 hours instead of 24. The sun is eclipsing the moon’s orbit, passing behind it while the moon in the foreground sets to the west more slowly. By 2:06 pm the smudge had become an orb covering more than a quarter of the sun, perhaps a third. Finches chirped their normal mid-day chatter. A white butterfly flew about the yard. In the neighbor’s large six sparrows sat a willow branch. Their combined weight caused the branch to bow down a bit. Other sparrows sat other willow branches. Their attention was on a bird feeder my neighbor keeps filled during the summer. I could not see the feeder, just sparrow launching off willow wands in one direction out of sight and then returning. Before the neighbor’s willow is a redbud in my yard. A gentle gust of wind caused some but all redbud leaves to rustle and the willow to wave. By 2:15 the dogwood and maple had joined in with leaves moving for a moment and going still. The sun appeared as the wide grin of a Cheshire cat rolled onto its left side. The wind picked up. Arbor vitae and red cedar juniper branches moved with the leaves of deciduous trees. A couple of sparrows perched momentarily on our empty bird feeder. Then moved on. The sun came out again, blazing through a vale of white. By 2:30 it looked to me eclipsed with the east horn matching the west horn of light. From my Somerville porch the eclipse is twisted to the west, not perpendicular with horizon to the southwest. Instead the horns of light, the corners of the open-mouth smile, are pointing to the West. Wisps of passing cloud give the sun, viewed through my very dark glasses, the look of smoking. As the world turns, the horns of the occluded sun appear to rotate downwards. The moon stands before the sun, blocking about a third of light for what seems to me like a wonderfully long time. Yet it has only been 15 minutes. I took a piece of paper, about 4 by 4 inches, and with a sewing needle poked a hole in the middle of it. Sunlight streamed through the window onto the kitchen table. I held the paper in the sunlight, tipping it to be more perpendicular to the sun. On table top a tiny bright spot appeared in the middle of the shadow square. I got out the magnifying lens, the one we keep for reading warning labels not meant to be read. Held the lens above the spot of light on the kitchen table, while in the other hand held the shadow puppet. Through the lens I thought I saw tiny crescent eclipsed sun. Concerned that perhaps I had made a crescent hole, I rotated the paper to turn the image. The image did not turn because it actually was a projection of the eclipsed sun through a pin hole. The leaves and branches continued to rustle. Raucous sparrows continued to seesaw on willow branches while cleaning my neighbor’s bird feeder. A siren wailed in the distance. Here a passing cloud, or passing shadow of a sharp-shinned hawk, would have disturbed nature more than did the moon eclipsing the sun. Another fifteen minutes passed and the moon counter-clocked across the face of the sun. The horns of the crescent sun tilted from West towards South. Clouds thickened and the sun faded from view. I took a look without the special glass and could not see because the sun was too bright, despite the cloak of clouds. My passing glance left momentary spots drifting before my eyes. I retreated to the kitchen table with pin-holed paper and magnifying lens to wait for sufficient clarity of light. At 3:20 pm, an hour after a cloud hid the sun, the sun and moon continue to mostly hide while I sought glimpses of dark orb moving left across bright orb. The wind gusted stronger confirming that clouds moving in and fronts on the move were a great influence than was the moon passing before the sun. The sparrows quieted down either because they had sufficient seed or because they’ve moved on to better pickings. Sunlight does not fall brightly again on the kitchen table. 3:45 pm, through my special eye protection glasses the clouds were black, they moved like waves of varying thicknesses over the sun, washing from right to the left side, where the black rim of the moon lingered before the sun. The moon that began at about 5, if the sun’s face were a clock, had swung around to 9. From there the moon continued to exit off to the left growing smaller in length and width. By 4 pm, the inverted bite of apple had slipped away. Sun was round, complete once more. Moon and sun had gone their separate ways across the sky. NOTE: The photograph was taken on August 22, 2017 by a student of Tom Hallock, Associate Professor of English at the University of Southern Florida, St. Petersburg. Tom and I were colleagues in John Elder’s nonfiction writing workshop at Orion’s Breadloaf Conference. John distributed what Annie Dillard called her finest essay, Dillard experiencing an eclipse. Tom distributed the article to his students and here it is in the photograph. I was most thrilled and envious to see the student had found a tree with pinhole-camera leaves projecting many eclipses onto Dillard’s piece. During the eclipse I searched the dozen or so small trees around my house for this solar effect without success. With students there are always wonderful discoveries.